This is written in honor of 9-11. Eight years ago, terror and heartbreak struck the U.S. Family and friends were killed. And fear entered the minds of Americans. Eight years ago four planes were hijacked and used for suicide and murder on the east coast of the U.S. Two planes were used to crash into the Twin Towers of the World Trade Center in New York, one hit the Pentagon in Virginia just outside of Washington D.C., and the other tried to hit the White House in Washington D.C. Sadly, the planes were successful in hitting the Twin Towers. The two buildings burned and crumbled to the ground in minutes. People who had been working on the higher levels of the buildings had not managed to escape, which sadly resulted in death. The plane aimed toward the Pentagon also succeed. Luckily, some people were able to escape and survive. As for the plane aimed at the White House, luckily did not hit its target. When the passengers on the plane found out that it had been taken over by Al-Qaeda terrorists, they reacted quickly. They were able to gain control of the plane and steer it away from the White House. They crashed it into a nearby field without harming anyone who wasn’t on the plane. 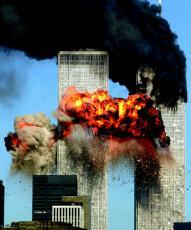 A total of 2,993 people died on September 11, 2001 from the attacks. This includes the hijackers, people in the buildings, and the passengers on the plane. Also, a few people died from lung disease that was caused by the dust created by the collapsing of the Twin Towers. Many friends and family were lost. People were afraid that more attacks were under way. People started to panic and get worried. Luckily, nothing else happened that day. After everyone realized they were safe, they started to grieve for loved ones. People were eager for bodies to be identified and find out if family had survived. The United States grieved for months after 9-11. Memorials were held across the country. Names were listed on TV and in newspapers. Tomorrow will be the eighth anniversary of September eleventh. Tomorrow people will be thinking about lost loved ones and people who died in such a horrible way, a terrorist attack. Take some time to think about and mourn for everybody who lost their life because of some stupid, evil men. Be thankful that more people weren’t hurt and thank the passengers on the forth plane for saving the White House. Make tomorrow a day of memorial. Thanks everyone for reading this and I hope you enjoyed it. Never forget what happened on September 11th. Here are a few links to websites about 9-11 and also pictures from 9-11. Check them out and let me know what you think of them and this. Thanks!!! © Copyright 2019 Violet Moon. All rights reserved. Um, yeah, I almost cried while reading this, any longer and I'd be in tears right now! I wanted to burst. You know tomorrow is actually my Bday, people don't take in count that mourning isn't the only thing people are doing, not you, but some people forget people are born on this date, people had weddings on this date, people died on this date who had nothing to do with the attacks, it's just, it's been 8 years, every year I fear the worst that it will happen again on my special day! And the mourners don't realize that not only does it hurt for them, but for someone like me to celebrate my birth on their loved ones death is not a settling feeling. It hurts to know that you are the unfortunate one to celebrate on this day, why that day? Why not the next day? Why is it always me? For I deeply am sorry for the loved ones, I'm moving on now, with my life and so should others! It's my Bday and I've learned to swallow it in whole and move on! Hope your day is special tomorrow as it will be for me as I try to hold back my sadness on this constant reminder. I appreciate you putting this piece up! Amazing what you've done and I hope everyone pays tribute to the loved ones and the lost ones and the unfortunate ones, and the patriotic ones! Love as a country, love as a writer, and love a friend. That was good Violet, it is important to remember the loss loved ones who died on that horrible day. Good job! I remember that the day it happened, the teachers wouldn't tell us at school, so my mom had to tell me that afternoon. It's a great thing to remember the past, so long as people don't dwell on it. ... It's good to remember the good, but it's sad to remember the bad. ... That's real good writing. I'm sure people remember it. But at the same time, I think they may want to forget it. Know what I mean? you did a very nice job. very touching! ! ! i see that one of your friends uncle was killed in this, i am so sorry for her loss. it is so nice of you to write this for her. . . well done . . . . . . This was so solemn, and touching. I almost started to burst into a sob, but I managed it. 9-11 will be remembered for the good and the bad. And this memoir exactly tells why. Excellent job. this is really excellent ? 9-11 was a tragic event... i think i was in first grade, but i understood... i hate crying UGH 2nd sad story in a ROW!!! haha welll i am sure this ought to have an i like it vote!! ? wow!! its very good of u for remembering. My mom workd there, so I lived thru the horrible unknowing, thankfully, shes alive and physically well, but deep down shes highly affectd. Thank you sooo much for updating me on this!!!! Thanks. Yeah, it does and that was what made it hard to write this. I didn't want to make people remember this horrible event but some people like to remember if they have lost family and I decided that it would be better to write it. I agree and your welcome. Thank you for reading. I dont even live in the USA, im in England yet i remember coming home from school and being told that the twin towers had collapsed. I didn't know anyone who lost their lives yet it still hit hard as im sure it did for people all around the world. We should remember those who lost their lives because of some stupid men. This articcle touched my heart, and im glad someone wrote this =] Great work! 9-11 is a really sad time and all the people that died in those attacks deserve to rest in peace and know that no matter where they are we are all sorry that this went down. I hope they enjoy thier time in whatever after life they believe in. Thank you, Violet, for writting this. It's a really good peice... and it shows just how much we care and greive along with the families and friends that have lost their love one in this terrible, horrifying, event. This page was created in 0.5241 seconds.